My very first job was working at the movie theatre as the popcorn girl. It was the perfect job for me because 1) I love movies and 2) I love popcorn. The theatre I worked at wasn’t at a big Cineplex or AMC, it was at a little theatre called Rainbow Cinemas. It was the type of theatre that still played those animated pre-show commercials with the dancing hot dogs and the soda drinks doing acrobatics, but people didn’t care because it was cheaper than going to the big-screen competitors. It was fun while it lasted and even till this day when I go to the movies I can’t help but reminisce on the behind the scenes operations of a movie theatre. Although watching movies in the 3D / VFX / VIP experience is cool, I personally much prefer the old vintage theatres. My attachment to them developed after watching Who Framed Roger Rabbit when I was a kid growing up in the 90’s, where I was lucky enough to experience the remaining simplicities of a rapidly evolving era. So when one of my friends invited me to her wedding that was taking place at The Eglinton Grand, I was ecstatic. 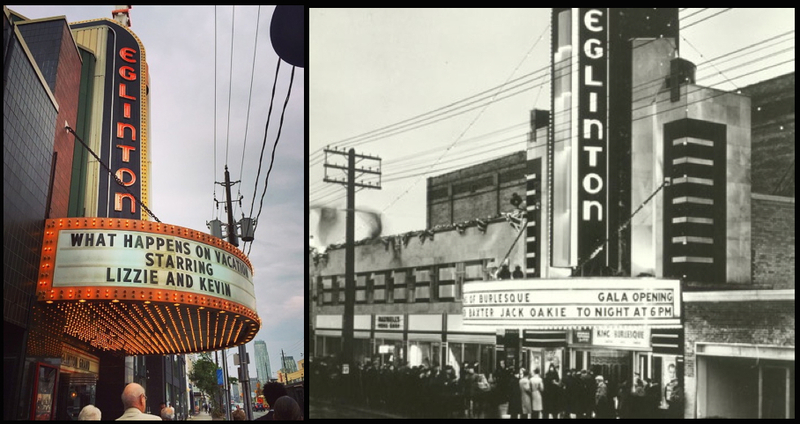 I’ve driven by the Eglinton Grand numerous times thinking it was still an operating movie theatre that survived the multiplex takeover. But when I found out that it was in fact an old movie theatre from the 1930’s that’s been transformed into a special events venue, I was super excited to check it out on the day of her wedding. Naturally, I took some snapshots during the wedding and I thought I’d compare some of them to the original pictures of when the theatre was at its peak. What makes the Eglinton Grand stand out along Eglinton Avenue is its big Art Deco sign that pokes out from the other shops and buildings down that strip. Pulling up at the entrance already provided that Old Hollywood allure as we stepped onto a red carpet and walked under a lit up marquee sign. The marquee displayed my friends’ names under a made-up movie title that cleverly described their love story. And so the show began. Doormen decked out in uniforms and charming hats greeted us and opened the door as we walked into the main lobby. The nostalgic 1930s charm of the era was maintained through the black, red and gold Art Deco design of the lobby, polished with a sleek update. After the ceremony, we headed for cocktail hour that was being held in the mezzanine of the old theatre room. A luxurious black velvet curtain covered a section of the room and the dim lights glistening over the jazz music created a sophisticated air as we sipped on our Gin & Tonics. As we continued to mingle in J. Gatsby style, the black velvet curtains had slowly drawn and we looked down. The bride and groom walked in the centre of the reception floor and danced their first dance to Elton John’s Your Song. The spotlight highlighted them brightly as everyone adorned them, yet they were far enough to share an intimate moment only to themselves. It was perfect. 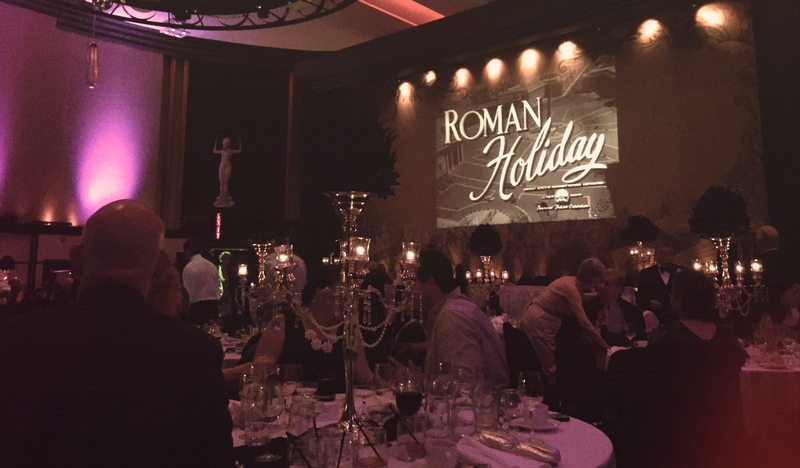 My favourite detail of the night: old black & white movies were being played silently on the screen during the reception. How glamorous it felt to wine and dine with the beautiful Audrey Hepburn in the background. The DJ might have been playing today’s Top 40, but throughout the entire night my mind was set in 1930s Los Angeles. And finally, my last Before & After shot happened completely coincidentally. While hanging out in the lobby, a painting of three Grecian women in long dresses caught my eye. 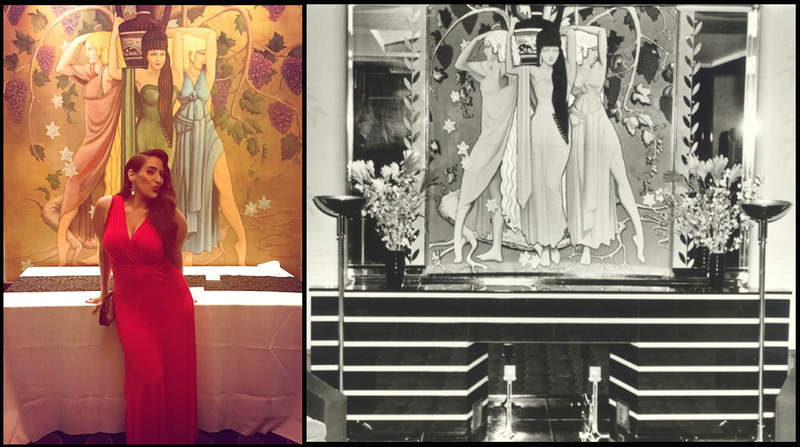 Of course, I had to take a picture in front of the painting doing my best Jessica Rabbit pose. Funny enough, while I was looking for old photographs of the theatre to add to this blog post, I was thrilled to find that familiar painting amongst the archives. Although it seems to be a replica, the same painting had been displayed in the lobby back then. I was so happy that even small details like that had been preserved when the venue was re-designed. Event Feedback: 10 out of 10. Not only was it a fun night with close friends celebrating two cool cats in love, as a venue I think The Eglinton Grand recreates that old Hollywood romance that’s elegantly fit for a wedding. 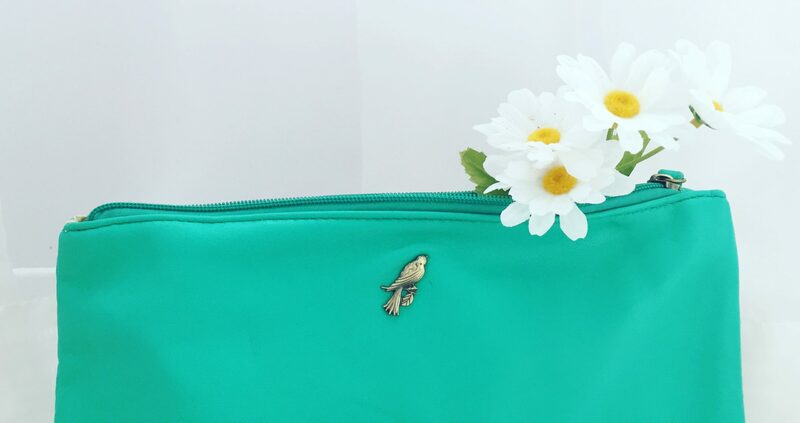 It’s creative yet classic, and the authenticity of the era is felt through the architecture and decor, and that nostalgic air that still lingers. What are your thoughts on The Eglinton Grand? Do you guys have any favourite old landmarks and buildings in Toronto?